Makani decided her foster mom is just too busy running around doing everything – washing dishes, making dinner, folding laundry – so she decided to put a stop to that and is helping by sitting in the laundry pile looking pretty! How would you like a helpful, considerate cat? In fact, because she’s a little on the shy side, half the time you won’t know she’s there! Totally no trouble – she’s just looking for a quiet home where she can do her thing. She lives in a busy foster home with cats, dogs, and grand kids and would probably prefer something a little less busy.Her main requests are yummy food, a window seat, and a friend of the feline variety – after all, even shy cats needs a friend who speaks the same language. 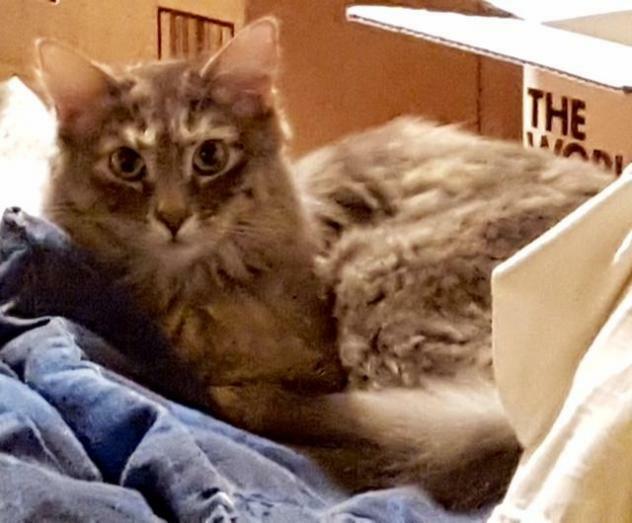 She would love to be adopted with her handsome brother Moki if possible, but if you already have other cats we can help with gradual and appropriate introduction.